Hans A. Hansen was born in Denmark and immigrated to Utah in 1853. This American 1 and 1/2 story home with a central passageway plan was one of the first large homes built outside of the fort. He painted the doors with green paint,that he had brought from Denmark. The interior carved circular staircase was constructed of pine and consists of three sections expertly joined by master carpenter and painted to resemble oak. The center passageway and upstairs rooms and halls retain the original oak-grained woodwork. The exterior of the house is of adobe – a rough, mud brick-plastered over, then carefully scored off to simulate stone masonry with incised lines painted red. Franklin Bailey was an early settler in Manasseh (settlement miles west of Ephraim). He brought cedar and pine logs from the mountains and built a log cabin. It has a unique narrow tongue and groove ceiling that is still in its original state. 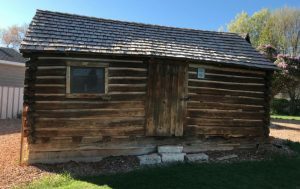 It has been used as a home, granary and standing vacant being vandalized until the Fort Ephraim DUP purchased it for $150 and eventually found it a home in the Pioneer Park. Soren A. Sorensen built this cabin in 1879 on third South and Main Street. 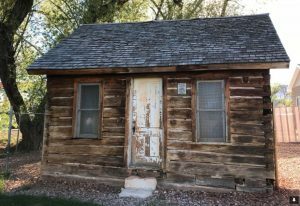 This cabin was preserved through the efforts of the City Council and DUP. After moving it to the Pioneer Park and decorated for Scandinavian Festival, it was vandalized, marked with graffiti and fire was set by an arsonist, which destroyed a portion of the new roof, east walls and floor. The quick actions of nearby citizens and merchant saved the cabin from utter destruction. It was opened in 1993. This property was first deeded to Hans C. Jensen by George Taylor, Mayor of Ephraim City on January 17, 1872 (Block 14, Lot 2). At that time the property included the Ross P. Findlay Lot. Granary was moved to Pioneer Memorial Park in July 2003. Hans came to Utah from Denmark and married Nellie Lundstein who came from Sweden. Hans ran the Christian Williardsen Lumber Mill located Southeast of Ephraim just below what was known as Guard Knoll. He milled the lumber for the home, granary and barn. The rock for the barn and the home were obtained from the Quarry in Pigeon Hollow. The barn was subsequently torn down by the City. 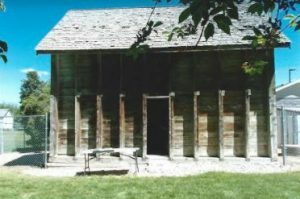 The home, granary and barn were built by A. C. Nielson (called Mormon Preacher by the people of Ephraim). Hans and Nellie had 10 children and they all lived in the Granary. Nellie died with the birth of her tenth child. One of the ten children was Amelia Dorothy Christina Jensen who married Christian Bjerregaard and one of their children was Helen Bjerregaard Rigby. Helen’s tireless work was instrumental in the initiation and success of the Ephraim Senior Center.